First thanks for your software which is very useful for me everyday. One missing feature in my day to day work, is the ability to give a custom name to the external editors. Indeed, for the moment, the name of the external editor (which is shown when right clicking a file in Edit sub-menu) is derived from the executable name, it's great but not sufficient because I configured two time the same editor but with another set of command line flags (for information one for remote editing all files in the same instance and one for creating a new instance of the editor). To workaround this leak, I have to remember that the first Gvim is for remote and the second for no-remote. 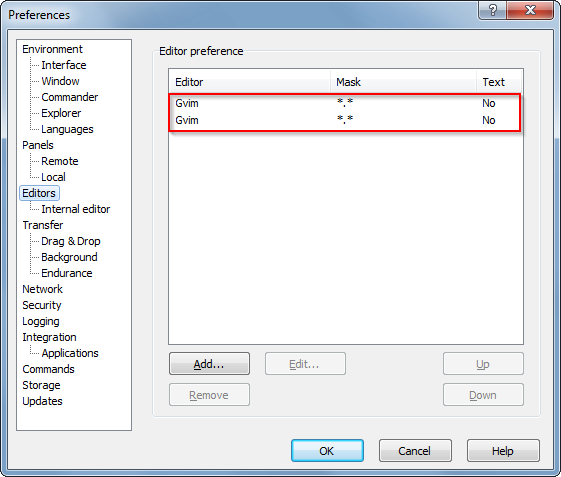 A great GUI improvement will be to allow giving a custom name to the editor (why not defaulting it to executable name). Meanwhile you can create a copy of the gvim.exe to distinguish them.